The Pestilence Master's Shroud Set Dungeon is located in Act III, The Keep Depths Level 3. Take the waypoint there, and navigate the dungeon until you find the entrance to The Larder (the place you fight Ghom). The entrance to the Set Dungeon should be to its right, and will open up if you have the Pestilence 6-piece bonus equipped. The Pestilence Master's Shroud Set Dungeon's two unique Primary Objectives are to: 1) Hit enemies 150 times with empowered Bone Spears; and 2) Do not take 400,000 damage. The Pestilence Master's Shroud Set Dungeon is a Westmarch streets tileset of a relatively small size. There is no predetermined path required to clear this challenge — a simple counter- or clockwise round trip of the map as you kill everything in your path should suffice. Voracious Zombies, Bloated Corpses and Ratlings — swarms of these near-harmless monsters populate the majority of this dungeon, making themselves prime target for the first Objective. 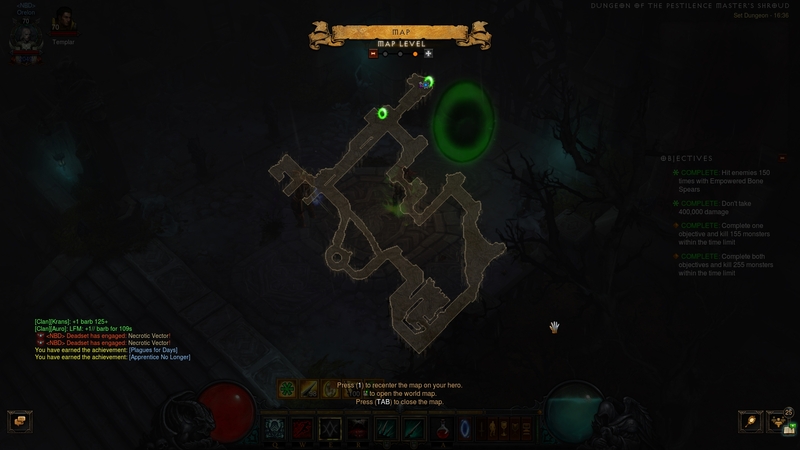 Necrotic Vectors — the unique enemies of the map. They resemble Act III's Rat King trash, but also have the Poison Enchanted affix. There is nothing noteworthy about these elites, but you will do well to dodge their poisonous attacks and affix considering the 2nd Objective. This Set Dungeon is incredibly easy to complete, even moreso because it works in unison with the basics of the Pestilence set — ranged gameplay and Corpse consumption-related mechanics. Most notably, make a point to either delay Devouring corpses a bit, or to finish nearby monsters off before the Corpse Lances spawned by the Pestilence 2-piece bonus have cleaned up the area. This is easily done by a reliable AoE Bone Spear rune like Teeth. The 2nd Objective, not taking 400,000 damage, should be trivial to accomplish as long as you maintain sufficient range from the swarming enemies and do not neglect incoming elite affixes. All in all, this is a trivial Set Dungeon to master.